Frank Tack baseball field, Clearwater, Florida. It was a warm and somewhat foggy night. Two teams are battling it out. Mostly teenagers and guys in their twenties. The only exception is 57-year old Aris Sakellaridis, the oldest guy in the league. It had been a pretty uneventful game until the 6th inning when all of a sudden a tall figure was walking in from the right field parking lot. It seemed as if everyone stopped what they were doing to see who the figure was. It looked like an old classic picture of the great actor James Dean. 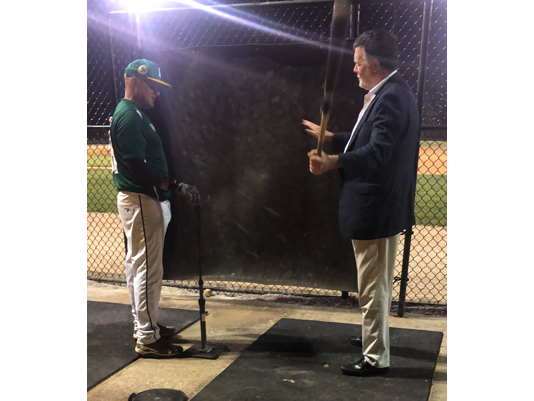 Well it wasn’t James Dean, it was Yankee co-Chairman Hank Steinbrenner who decided to come to the game to see his friend Aris play. The young players, and for that matter all the players, were blown away that Hank would come down to the field to watch everyday people play. Michael Kelly is the Pandas’ designated hitter. As it turned out he had been a spring training intern for the Yankees. Now he works for the Yanks class A affiliate, the Tampa Tarpons. Kelly is the public address announcer during the Tarpons’ games. In between at bats he got to spend time with Hank getting advice on steps he should take in order to advance in the world of sports management. Hank could not have been nicer in his advice to this aspiring young man. He was like a professor talking to his pupil. One by one some of the other players and some parents would come over to shake Hank’s hand. As you stand next to this man and listen to him talk about different subjects you realize how much he really has to give to the world. This morning I was watching the animated film “Henry & Me.” I had forgotten that Hank did the voice of his father, George Steinbrenner. He may have been the best actor in that film. I must add that the other actors were named Richard Gere, Luis Guzman, and two Oscar Nominated actors named Danny Aiello and Chazz Palminteri. I guess he is just like James Dean. Last week I had the pleasure of having my off Broadway play, “Batboy, A Yankee Miracle,” performed by my cast in Hernando County, Florida, for the U.S. Veterans and First Responders. 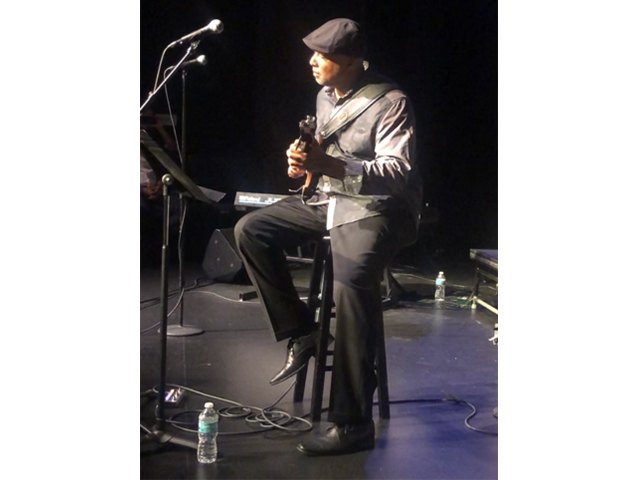 I also got to do two, one-man shows with the original music of the incredible Alex Martin for the Admiral Farragut Academy in St. Petersburg, Florida where 100% of the proceeds went to the area charities. 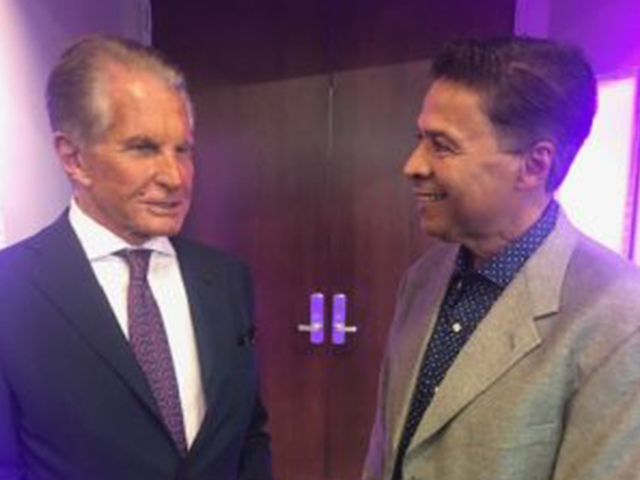 After the shows at the Academy, I had a reunion of sorts with the legendary actor George Hamilton. 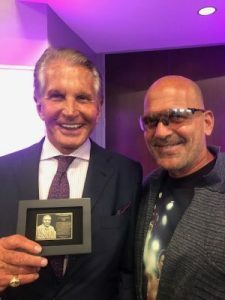 It was “Love at first bite!” (Title of the 1979 Horror Comedy movie that starred George Hamilton as Dracula) Actually it had been probably 40 years since the last time that we had seen each other. The first thing out of Mr. Hamilton’s mouth was “I remember your hair well, what happened to it.” He was referring to the fact that I had a rather large Afro hairstyle in the decade of the 70s. Now I keep it short and straight. I told Mr. Hamilton that it’s called old age. He looked at me and laughed. We got a chance to talk about how much he liked George Steinbrenner and the great relationship that the Boss had with his dear friend Cary Grant. 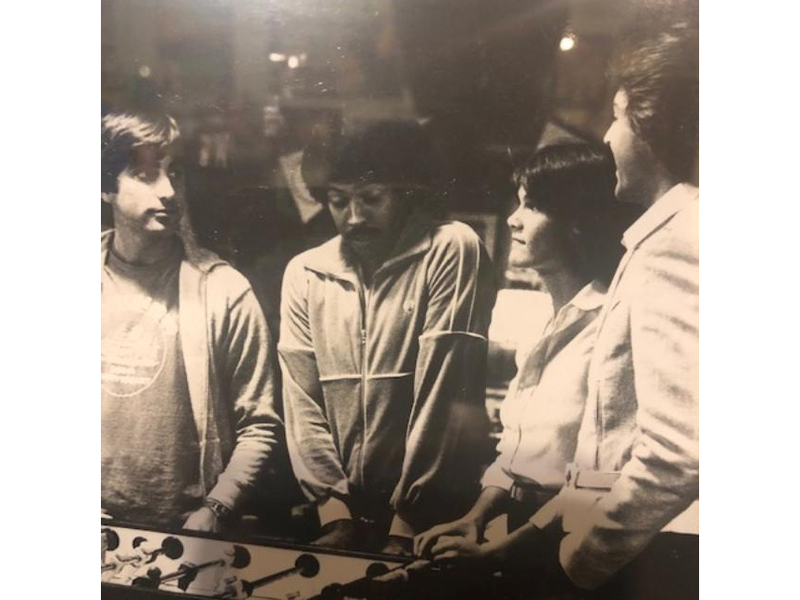 Mr. Hamilton told me how terrific the Admiral Academy had been for his son George Jr.
Mr. Hamilton said he would always have fond memories of his great Hollywood friends and him visiting with the Boss during those Championship games in the 70s at the old Yankee Stadium. It ‘s opening day and I just finished reading the fabulous book, “Big Fella,” the very thorough story of Babe Ruth. Having met members of the Ruth family throughout the years, I was able to truly appreciate some of the Babes intimate family moments. It also made me understand why he loved kids so much. His feelings about them was a wonderful reminder of how great the big George (Steinbrenner) of my era was. Approximately 10 years ago, I agreed to participate in an animated film entitled “Henry & Me,” a story about a young boy battling cancer who is taken on a magical adventure by a stranger named Henry. 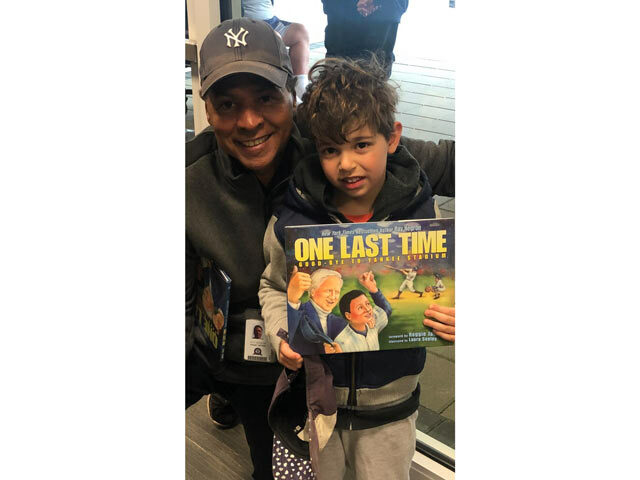 During their journey, the boy meets New York Yankee legends, both past and present, who give him lessons about baseball — and life. I actually received a signing bonus and at the press conference I signed the back of the check and handed it over to Daniel Quintero, from the Kips Bay Boys and Girls Club. I also agreed that if the film made money, the proceeds would also go to the club and a couple of hospitals that I’m involved with. Some of my great friends from the sports and entertainment world joined me in making the film including Richard Gere and Chazz Palminteri. They came into the studio to loan their voices for their characters. Danny Aiello, who appeared in “The Godfather” among other great films, blows it away as the doctor who cares for the young cancer patient. I was very proud that the producers of the film thought enough of my children’s book series that they wanted to do an animated film based on those books. To see George Steinbrenner in this film as an animated character really made me happy, because his young family members would be able see a little bit of what their grandfather and great grandfather was all about by watching the film. To hear the Boss’s oldest son, Hank, play the role of his father so professionally was very inspiring. After five years of hard work on this project and some very wonderful reviews I felt a wonderful sense of achievement for everyone involved. After the film premiered at the Ziegfeld Theatre (with all the pomp and circumstance” I thought we had a “Disney type” of movie that would stand the test of time. Because this was one of the very few baseball films ever done and the first with actual Yankees lending their voices, I thought, at the time, how could we go wrong? Even though my role in the film was strictly in the creative end, it broke my heart that the film did not do well commercially. It hurt even more that I was not able to give another check to my friends, the kids at the Kips Bay Boys & Girls Club. My friend, David Jurist, from Hackensack Medical Center, deals with the pediatric cancer program at the hospital and whom I support by putting together visits for the children with my many celebrity friends, kept telling me not to count on the film because motion pictures are always a “crap shoot,” no matter how good they are. When I was reading Jane Leavy’s book on Babe Ruth, “Big Fella,” I couldn’t help but think about how beautiful this film is and how something should be done to bring it back to life again. If for no other reason than to have kids and their parents sit down together and watch something good and something real. 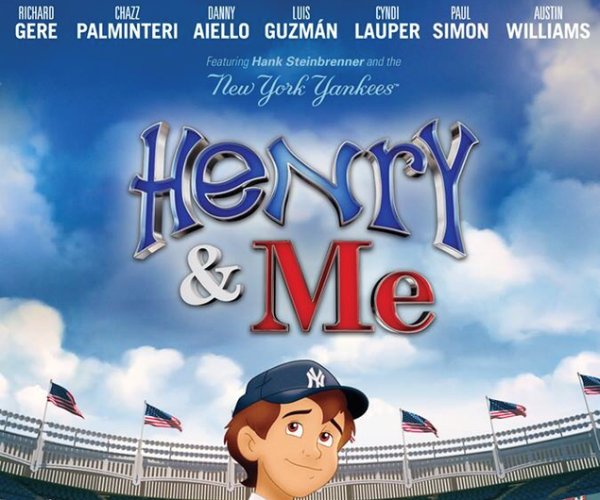 I know that some of you remember me writing a “Henry & Me” story last year during opening day and I guess this is my annual plea to bring this film to prominence, where it belongs. To purchase your copy of “Henry & Me” today please visit here. When I saw the new commercial on the Yes network about the up and coming Yankee season, I was blown away. The ad features Aaron Judge and Giancarlo Stanton and “Sir” Didi Gregorius and his double play partner Gleyber Torres. They also have Ken Singleton, Michael Kay, John Flaherty, David Cone and Paul O’Neill. This commercial is very tactfully and tastefully put together. 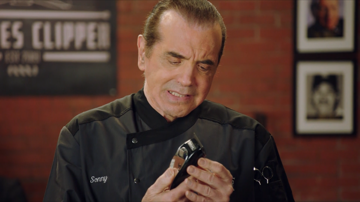 Just when you think you have seen it all, in pops the great Academy Award nominated actor Chazz Palminteri. Chazz just gives the commercial that true Hollywood feeling. Charlie Santoro, a sales specialist at YES and a part time actor who plays Chazz’s assistant barber in the commercial, said that having Chazz in this role made every one bring their “A game” to the set. I was told that Chazz was very generous in helping all the people on this job. When I spoke to Chazz about doing this commercial he responded by saying that it was truly a lot of fun. 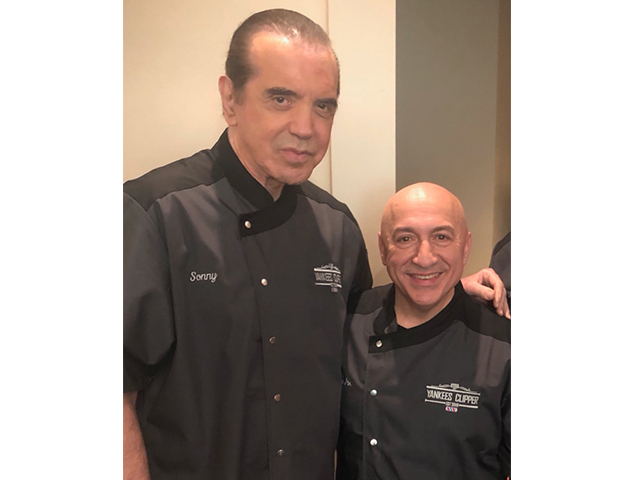 One actor said that when you have a Chazz Palminteri on the set, it’s like the equivalent of a young player being on the field with Mickey Mantle. I personally have spent as much time in the world of entertainment as I have in the sports world. I can honestly say that of all the actors and entertainers that I have known, I have never met a bigger Yankees fan than Chazz Palminteri. Having Chazz in this commercial for YES was genius casting and what ever they paid him was worth every penny. There was no wasted talent in this Bronx Tale for YES! Last night I got to go to the Murray Theatre at Ruth Eckerd Hall in Clearwater, Florida. 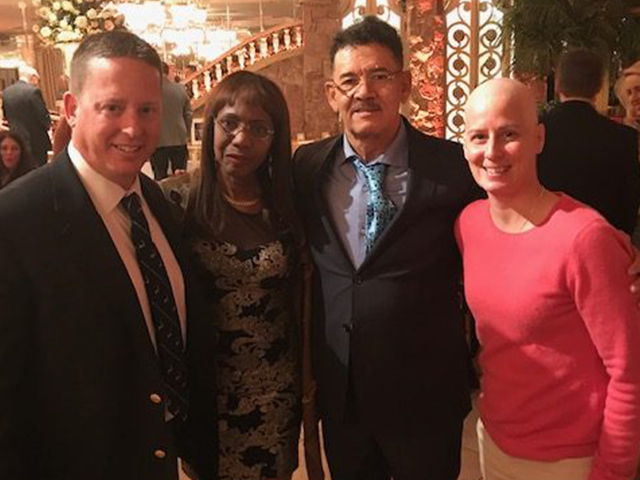 The main attraction was former Yankees’ superstar Bernie Williams. Every seat was filled with baseball fans and music lovers. 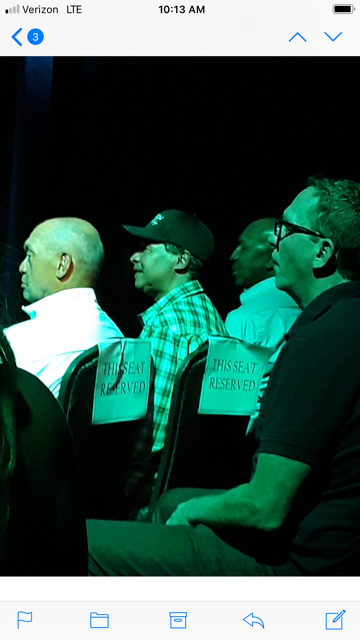 Among those in the audience were some of his former teammates like David Cone, David Wells and Tino Martinez. Also on hand were Yankee icons Willie Randolph and Mr. October himself, Reggie Jackson. When Bernie walked on stage, the feeling was like being at the first game of a World Series. It was as if Bernie went up to the batter’s box with his bat, then turned to the umpire and called time. He asked for the batboy, handed him his bat and the batboy then handed Bernie his guitar. At that moment Bernie proceeded to hit it out of the park. Song after song from Bernie’s magic fingers just mesmerized everyone in the audience. The usually quiet Willie Randolph acted like a “teeny bopper” at a Beatles concert. Willie could not hold back his emotions because like everyone in the audience, the music just ran through your soul. I have seen Bernie perform before but there just was something very magical about last night. After the show I asked Bernie if there was a difference in the emotional preparation for this show as compared to that of a World Series game and Bernie said that it was pretty much the same. He also said that just like baseball, he practices with the guitar every day. The elegant living room setting of the Murray Theatre made it that much more magical. It made the audience feel like they were a part of the band. With that type of setting, Bernie made you feel like he was performing just for you. The true home run in the show was when Bernie was brought back for a curtain call and he performed “Take Me Out To The Ball Game” like I have never heard it before. It literally brought the capacity crowd to its feet. Reggie Jackson is a man that I have big time respect for. He is also a person that knows his music. He is also the most brutally honest person that I know. With that being said I went over to him and asked him for his review of Bernie. Mr October had one word. GREAT!!! Earlier this week we had batting practice rained out. A couple of days before we actually had a game rained out. When this happens it gives the players a little extra time to rest but knowing our Yanks, they would rather be playing. The thing that really bothered me is when I walked around the ball park I see some very sad faces. I actually saw one kid crying and I asked his dad what was wrong and he said that because batting practice was canceled his son would not see Aaron Judge take batting practice. At that point I decided to go to the trunk of my car and get some of my children’s books and give them out to some of these sad kids and try to put a smile on their faces. 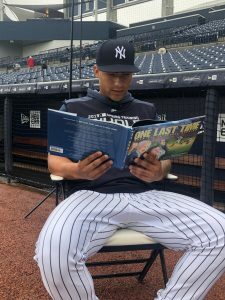 With the permission of the Yankees I even got to take a couple of them around the ball park to meet some of the players and they even got to read one of the books with Gleyber Torres. The Yanks explained to the kids that it was important to put as much emphasis on reading as they do on their video games. Dellin Betances even kidded with little Michael from New York that someday he might throw 100 miles per hour also. Nick from Ghana was ecstatic when Aroldis Chapman gave him a hug. Overall it made me feel so proud to be a part of the Yankees and see that the players really do care about the fans and especially the young ones. However Gleyber would say it best when I thanked him for taking a few minutes with the sad children that he was able to put a smile on their faces. He said kids are people too. They are our future. That’s coming from the future of the Yankees. In one breath I see a guy that’s ready to come into a game like Sparky Lyle or Mariano Rivera and just put everyone away. Later that evening, I see a very nice gentleman that enjoys his time with a bunch of kids that live in some of the best and worst areas of New York and Connecticut. We all shared a wonderful dinner together and told some very cool stories. 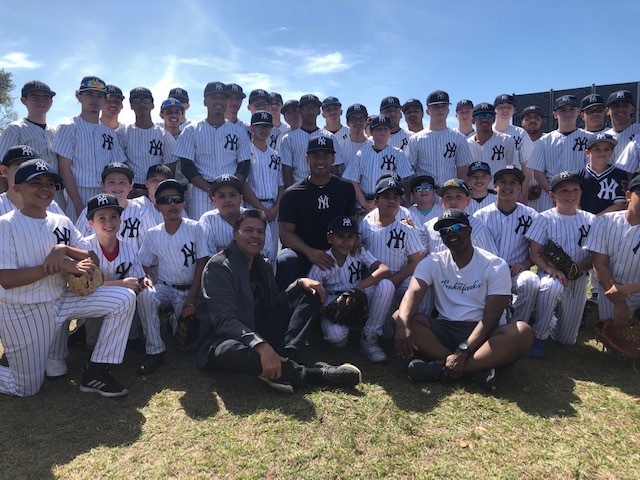 The kids felt like they were a part of the Yankees because of the way Ottavino treated them. Whether he realized it or not, he really helped lift their self esteem and made them feel good about themselves. Being a major leaguer is a great honor, however being a Yankee is the highest honor that a big league player can achieve. I remember Hall of Famer Roberto Alomar once telling Yankee owner George Steinbrenner that his only regret during his wonderful big league career was the fact that he never got to play for the Yankees. 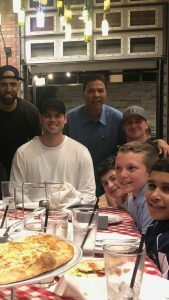 That being said, Ottavino is now a “Superman” to these kids and to kids all over the Yankee Universe. 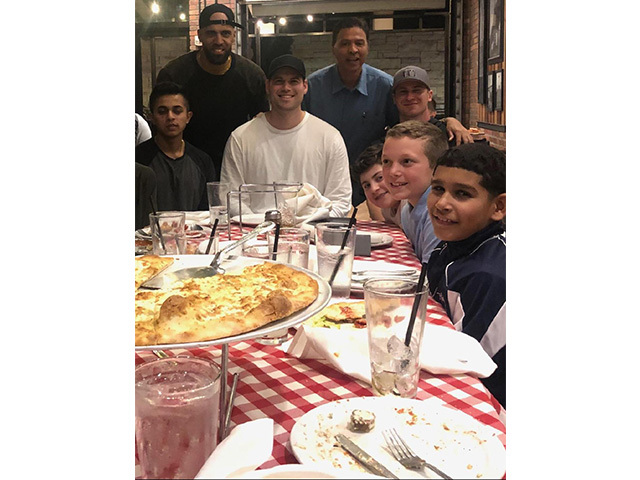 I’m really happy that I got to have dinner with Ottavino and all these kids because it showed me that the Yankees got themselves a terrific pitcher and a very fine young man while New York kids got themselves someone that they can really look up to. Gleyber Torres has picked up where he left off this past Christmas. During the holidays Torres arranged for hundreds of kids, that he didn’t even know, to get Christmas gifts. Today he was sharing himself and his heart with kids that need it the most. He spent his afternoon with kids from New York who usually would not have had an opportunity to meet their idols and get to sit with them and find out that they are regular people too. That was the message that Gleyber Torres gave to all of these wide eyed kids. Gleyber’s message was very simple. Respect your parents, respect your family and coaches and do not be afraid to follow your dreams. Gleyber explained that to achieve goals in life you must be willing to sacrifice. He also told them that school and baseball go hand in hand. As much as you give the game of baseball you must also give to your education. He explained that he would not be where he is today without the love and support of his parents. 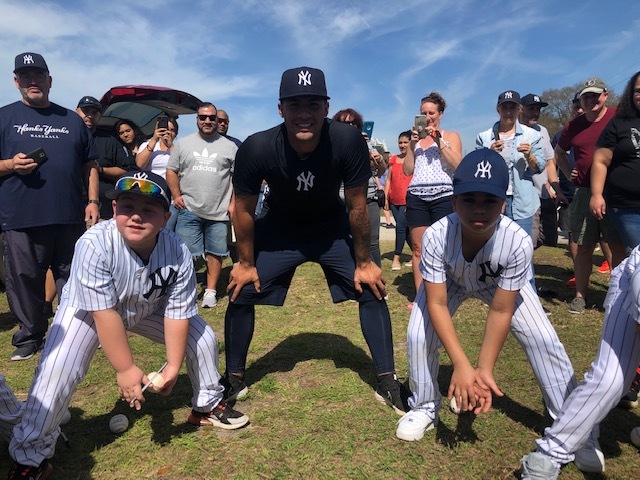 Gleyber told the kids that his parents had to make a number of sacrifices for the success that he has achieved today. 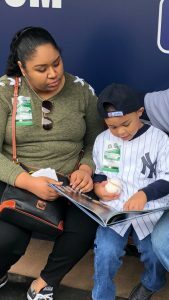 Thank you Gleyber and the Yankees for always being there for the little guy. I have always had a fascination with the true “rags to riches” stories of life. Stories of men and women who understood that a part of what they were accomplishing, they would also share with the world. In my life the names that stood out were Babe Ruth, Jackie Robinson and Roberto Clemente. In the world of entertainment it was Elvis and Sinatra, Jose Feliciano and Frankie Valli for me. To me, baseball and the arts walked hand in hand. I used to say that if I couldn’t be a baseball player that I wanted to be a movie actor. On August 16th, 1977, Elvis Presley died. I will never forget how sad I was that day because I was such a big fan. I was sitting behind Reggie Jackson’s desk answering some of his fan mail when Reggie walked into the room to see if there were any important letters in the bunch. He noticed that I was unusually quiet that day so he asked what was wrong. I mentioned that Elvis had died and how I was such a fan. I remember talking about the reasons that I liked Elvis, including the fact that he was very close to people that he did not even know, and how every time he did a movie he included his friends in the film. I remember how Reggie really paid attention to what I was saying. I did think that he was trying to be a soundboard for me. Well, that winter I got the biggest surprise from “Mr October.” He called me up one day and said how would you like to be in my Volkswagen commercial. I think I screamed out the biggest ‘Hell Yeah’ ever. One commercial led to another and another. 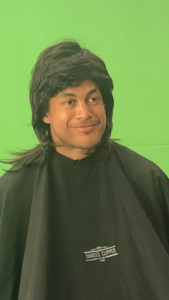 I did spots for products such as “Old Spice” and “Panasonic.” I also noticed how smooth Reggie was in delivering his lines. He was a natural. I learned just as much from him as an actor as I did from him in baseball. On the set I was pretty popular because the Yankees had just been World Champions and everyone knew that I worked for the team. The one thing that really stood out for me during the early days of the filming was when we had to go to wardrobe to check on our uniforms. I remember being a little disappointed because my uniform number was 66. I wanted a sexier number. Like one or four. I remember Andy thinking to himself then asking me, ‘What number did Jackie Robinson wear’? I said, ‘forty two!’ Then he said ‘and Roberto Clemente?’I said ‘twenty one!’ Andy said, ‘and Babe Ruth, and I said…..’3.’ Andy said when you put it all together it equals to 66. Andy, Joey and me laughed like crazy because it was a positive sign that I fell in love with the number. Then he smiled and told me to get out of there. Today, we celebrate the 100th anniversary of the birth of Jackie Robinson. The book that I was talking about with Mr. Steinbrenner was called “The Greatest Story NEVER Told.” The book is about the Babe and Jackie. It also introduces a young Roberto Clemente. It’s the story of love of faith and hope. I dedicate this column to some of my heroes of life. Men like Jackie, The Babe ,The Boss, Roberto, Feliciano, Elvis, Mr. Sinatra, Frankie Valli, Chazz, Murcer, Billy, Thurman and of course Mr. October.